Starring Demi Lovato as 15-year old Sonny Munroe, Sonny with a Chance is one of Disney’s latest teen comedies that parallels Hannah Montana and to some extent 30 Rock. Volume 1 has just been released by Disney and comes with a friendly family rating of G.
The premise revolves around Sonny joining her favourite TV series, “So Random!” thanks to her own internet film. All wide eyed and innocent, Sonny Munroe is thrust into the world of fame but thankfully she keeps her own personality without it being twisted into a Hollywood princess, unlike her colleague Tawni Hart (Tiffany Thornton) who believes she is a threat to her own popularity. Joining Sonny is a variety of other “stars”, each with their own strange quicks who are different to her wholesome country family values but this is where the series shines by putting little miss innocent in a variety of situations that is actually quite comedic. From Grady (Dough Brouchu), the nerd of the show to child star Zora (Allisyn Ashley), Sonny is quite amazed by their interpretations on the world and their strange eccentricities. Even though Sonny finds it difficult in relating and befriending these oddball characters at first, eventually they click and some great plots are created. 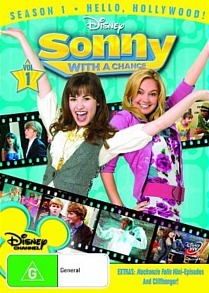 Another fun part of Sonny with a Chance is how they make fun of the current teen phenomenon which is highlighted well in this series, especially through the witty comedy and of course, the great acting by Demi Lovato who seems perfectly cast as her role. Definitely a fun series for teenagers!